Dilemmas surrounding the role for religious beliefs and experiences permeate the school lives of teachers and teacher educators. 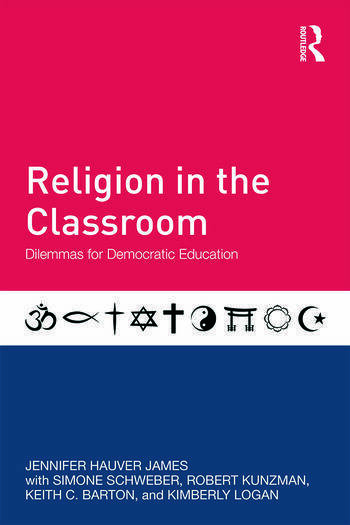 Inspired by the need for teachers and students to more fully understand such dilemmas, this book examines the relationship between religion and teaching/learning in a democratic society. Written for pre-service and in-service teachers, it will engage readers in thinking about how their own religious backgrounds affect their teaching; how students’ religious backgrounds influence their learning; how common experiences of school and classroom life privilege some religions at the expense of others; and how students can better understand diverse religious beliefs and interact with people from other backgrounds. The focus is specifically on classroom issues related to religious understandings and experiences of teachers and students, and the implications of those for developing democratic citizens. Grounded in both research and personal experience, each chapter provides thought-provoking evidence related to the role of religion in schools and society and asks readers to consider the consequences of varied ways of responding to the dilemmas posed. Beginnings. Chapter One: On Religion. Chapter Two: Toward Democratic Living and Learning. Chapter Three: Navigating the Legal and Ethical Dimensions of Our Work. Chapter Four: The Not-So-Hidden Curriculum of Religion in Public Schools. Chapter Five: Unpacking Narratives of Calling and Purpose in Teaching. Kimberly Logan. Chapter Six: Fishing Below the Surface: Understanding the Role of Religion in Student Learning. Simone Schweber. Chapter Seven: Reconsidering Religion in the Curriculum. Keith C. Barton. Chapter Eight: Talking with Students Who Already Know the Answer: Navigating Ethical Certainty in Democratic Dialogue. Robert Kunzman. Chapter Nine: Continuing the Conversation. Jennifer Hauver James is Associate Professor of Social Studies Education at the University of Georgia, USA. Simone Schweber is Goodman Professor of Education and Jewish Studies at the University of Wisconsin-Madison, USA. Robert Kunzman is Professor and Associate Dean for Teacher Education Faculty at Indiana University, Bloomington, USA. Keith C. Barton is Professor of Curriculum and Instruction at Indiana University, USA. Kimberly Logan is a recent graduate from the Department of Educational Theory and Practice at the University of Georgia, USA.